Your mailbox is the first impression of your home. Make it a Beautiful Mailbox. 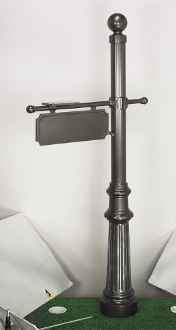 The Regency Post is a classic look; designed with a sign-arm above a hanging address plaque. Sample image shows a Regency post in bronze with a PC1 (ball) cap and a CB1 decorative base. All posts ship in 4 easy to connect sections; final assembly is required before installation. Assembly is quick and easy. The post stem is connected to main post via 4 bolts/nuts and the top section of the post is secured by the back bar which screws into the main post. Please note that our mailboxes are custom made. Once ordered, a new unit takes, on average, 4 weeks to be manufactured and shipped. Once you’ve selected a post be sure to select a matching mailbox can.